The fourth annual Lewton-Brain Foldform Competition attracts international metal artists and recognizes an unprecedented 27 Jurors' Choice selections this year from among a competitive field of submissions. FLORIDA, N.Y. - Aug. 5, 2015 - PRLog -- The Center for Metal Arts in the Warwick Valley, New York announced results for the 2015 Lewton-Brain Foldform Competition on July 24, 2015, at the annual Foldform Awards Dinner at the Seligmann Center for the Arts. With special dinner guest Charles Lewton-Brain, the celebrated pioneer of foldforming, the evening ended with the first video screening of the 2015 competition winners. Dan Lippitt of Madison, WI, U.S., won First Place with “Stovchen III,” a sterling silver tea warmer. Ira Sherman of Denver, CO, U.S. took Second Place for “The Hoshen,” a Torah Hoshen Breast Plate of sterling silver and semi-precious gemstones. Christina Brandewie of Cincinnati, OH, U.S., was awarded Third Place for a sterling silver and yellow gold “Honeycomb Bracelet.” Linda Leviton of Lewis Center, OH, U.S., received Honorable Mention for her large copper wall sculpture, “Animal Vegetable Mineral.” The jury also recognized 27 entries in the Jurors’ Choice round, a record high for the competition. Now in its fourth year, the Lewton-Brain Foldform Competition invites metal artists everywhere to submit their work in a global competition designed to survey the evolving field of foldforming as a metal arts technique. This annual event challenges makers to share their most innovative and best work, and recognizes new applications of the techniques first pioneered by Charles Lewton-Brain. 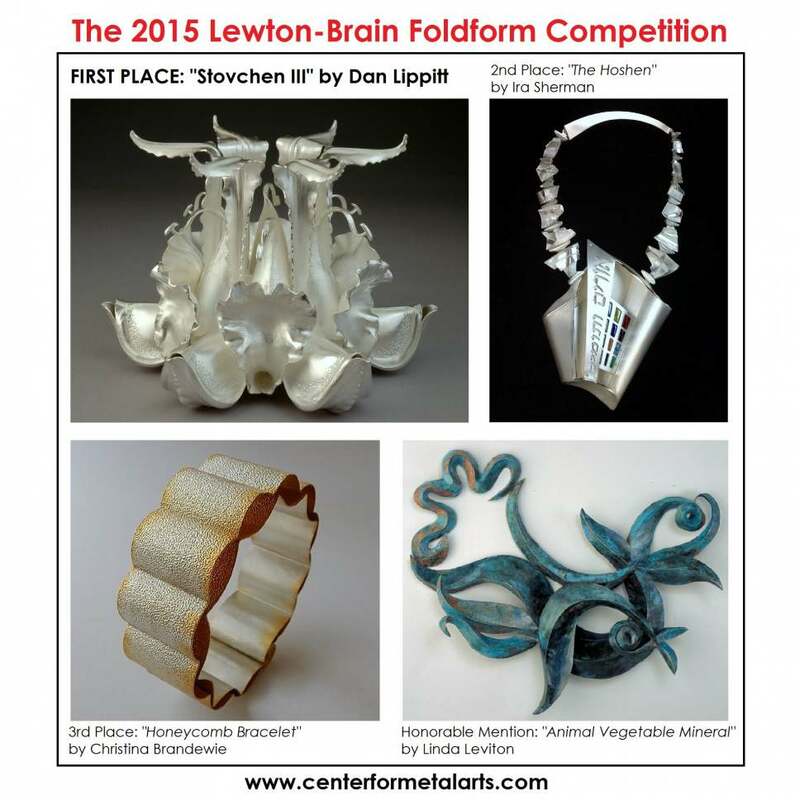 Hosted by the Center for Metal Arts, the 2015 Lewton-Brain Foldform Competition closed this year with a submission deadline of June 15th, 2015. The 2015 jurors are three well-known leaders in the metal arts community; Charles Lewton-Brain, Artist Goldsmith and Foldforming Pioneer, Hazel Wheaton, Editor of Art Jewelry magazine, and Dr. Hanuman Aspler, Owner / Co-Founder of The Ganoksin Project. They were tasked with selecting the winners and Jurors' Choice entries from a strong field of foldformed jewelry, sculpture, vessels, and functional objects from Aruba, Australia, Canada, England, Ireland, Mexico, New Zealand, Scotland, and across the United States. Competition sponsors that support this event are Art Jewelry magazine, Center for Metal Arts, The Ganoksin Project, the Revere Academy of Jewelry Arts, and Rio Grande. The winners will receive prizes including Rio Grande gift certificates, a one-year subscription to Art Jewelry magazine, and a small foldformed object crafted by foldforming pioneer Charles Lewton-Brain. Results will be covered in the November print issue of Art Jewelry magazine for the third consecutive year, with Jurors' Choice selections included in a special online gallery. The Ganoksin Project will share results with its global audience at www.ganoksin.com. For news about future competitions and to view previous years' video results, see http://www.centerformetalarts.com/foldform-competition.html. 2015 WINNERS: First Place is Dan Lippitt, Madison, WI, U.S.: “Stovchen III” (6.5 in x 4.5 in) (16.5 cm x 11.4 cm) sterling silver. Second Place is Ira Sherman, Denver, CO, U.S.: “The Hoshen” (45.7 x 25.4 x 6.4 cm) sterling silver and semi-precious gemstones. Third Place is Christina Brandewie, Cincinnati, OH, U.S.: “Honeycomb Bracelet” (7.6 cm x 2.5 cm) sterling silver, 18K yellow gold plated. HONORABLE MENTION is Linda Leviton, Lewis Center, OH, U.S.: “Animal Vegetable Mineral” (71 cm x 63.5 cm x 7.6 cm) copper, patina.